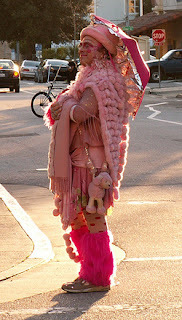 Just a few days ago, I walked with my friend to downtown and suddenly the Pink Lady became our topic of discussion. From her, I came to know that he's quite famous in Santa Cruz. I was calling him weirdo and not paying much respect, but my friend was talking about his real identity and so. She wasn't so clear about him either. But, whatever she told me, I was compelled to change my view towards him. Once, I tried to observe him carefully and attempted to talk with him but he awkwardly kept smiling. That really made me feel bad and may be that was the reason which caused me to have no respect to him. Oh, then, I came back to home, I asked my father, My aunt about that guy and didn't get quite a satisfactory answers. They've lived her for years and they didn't know the things about here much. So, a blink of light and next I was sitting in front of my computer searching on him. Gosh, there is a rumor about this guy, some say he's Teacher at UCSC, some say he's former millionaire and some even say he's an electrical engineer. I always wondered who he is, where he comes from, I really don't know. But some other neighbor told me that they saw him shopping once and so. One blog though, wrote about him as , "Umbrella Man", a former NASA electrical engineer whose real name is Robert Steffen, has been a downtown fixture in Santa Cruz for years." Whatever, he's actually become an icon of Santa Cruz. 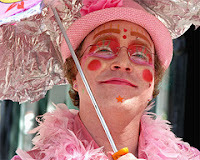 So, anyone who knows Santa Cruz will tell a word or two about this PINK LADY aka The pink Umbrella Man. O.o Thats so cool! I would want a person like that around..or not really... Well, i like how he isnt afraid to be who he really is... Anyways keep posting Navin! Thanks and the post has been updated. PS:If I had known the legitimate source, I would've done that. Thanks for the mention though.